Good morning, Friends! I feel like I am up way too early! I had so much fun at the baseball game last night! And the GJ Rockies won so that made it even more fun! Nick spent the night at a friend's house so I need to get him early because he is working with his dad today. Then I have a few errands and then I really need to think about tackling the laundry. Not only am I running out of clothes but we leave on Thursday! 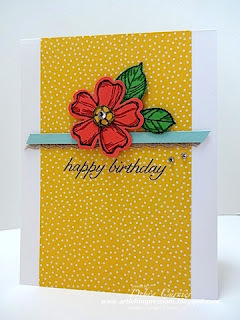 Today's card uses some fun bright colors! I love it!! Simple and feminine.